This stunning 3 bedroom villa is situated in prestigious development “Sunset Valley” with stunning views and privacy. 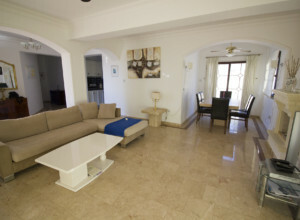 The villa has 3 good sized bedrooms, the master bedroom with en suite bathroom. There is also a separate family bathroom with bath and shower and a separate fully fitted high quality kitchen. The open plan living/dining area benefits from an open fire place. Outside there is 10m x 5m swimming pool. There is a built-in BBQ for alfresco entertaining, and a private block paved drive way and garage .